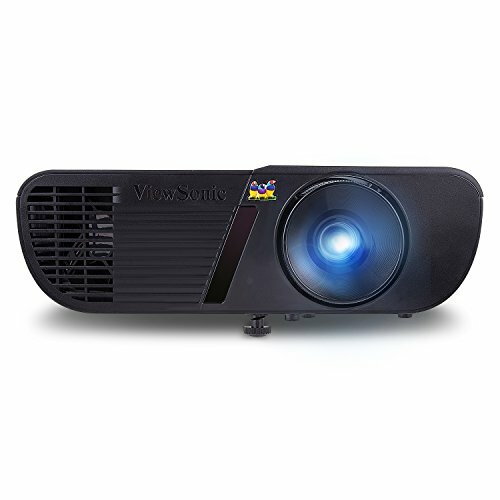 ViewSonic has a number of projectors that range from more portable, smaller units like this one, right up to powerful, professional units which pump out 1920×1080, or Full HD. The ViewSonic PJD5255 is a price-performance projector that features user-friendly design, native XGA 1024×768 resolution, and 3200 lumens. Furthermore, this projector features HDMI input, composite video, two VGA, RS232, one VGA output, S-video, mini USB, and audio in/out. This ensures that you will have your laptop, PC, smartphone, or some other device hooked up to this projector without a problem. The PJD5255 is intended for small business and education purposes, so it is not a full-fledged home entertainment projector by any means. This is a small and compact projector that will fit easily onto most desks. It is a great combination of features, performance, and affordability. You can adjust contrast and brightness from the projector menu, to the correct and adequate levels for your business presentations or watching movies. A tactile keypad ensures ease of use with concave and raised buttons, as well as a central reference button. These make the setup easier in dark environments or if your projector is mounted on the ceiling. The fan is located in the front of the ViewSonic PJD5255, and when the projector is on, the fan noise is almost unnoticeable which is a great advantage since some projectors produce big noise that can spoil your viewing experience. Hairline-textured metal surfaces provide this projector with an elegantly sleek look. If necessary, you are also able to finely adjust the projector’s height by twisting the elevator feet manually. Setup is simple and easy. This projector is packed with high contrast ratio (2400:1 typical, or 15000:1 in DynamicEco mode), and 3200 lumens, so it is guaranteed to project bright images in any environment, including rooms with ambient light. The ViewSonic PJD5255 boasts a sleek design as well as advanced SuperColor technology to provide great color and more brightness than usual in this class of projector. This ViewSonic’s SuperColor Technology delivers a wider range of colors than conventional DLP projectors, providing that users enjoy more accurate and realistic colors. With dynamic lamp control capabilities and an exclusive color wheel, this technology projects images with true-to-life and reliable color performance, in both dark and bright environments, without sacrificing image quality. This projector provides 5 pre-set color modes, so you can select the best one to suit your material. Those 5 modes are: Dynamic Mode for presentations that contain a lot of text; Brightest Mode for environments that require extra-high brightness, ViewMatch Mode for general viewing; Movie Mode for movie watching with better saturation in darker environments; Standard Mode for matching notebook or PC color.